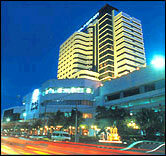 capital of the sunny island of Phuket, Asia's most popular resort. Surrounded by shops, street bazaar, entertainment facilities and the wonderfully preserved building of old Phuket, this 251-room hotel offers business executive the island's best meeting facilities, with easy access ( 15 minutes ) to sun-drenched beaches and golf courses and only 30 minutes from Phuket's International Airport. A room with a view. Each and every one of our 251 rooms and suites offers a commanding vista of the city and the Andaman Sea. From the moment you arrive to the time you check-out, you can be assured of the finest quality service and facilities. - Nearby golf courses and beaches where you can enjoy a full range of water sports. Occupying the entire 3rd Floor of the hotel, The Spa Phuket City is part of a chain of executive fitness clubs based through out South East Asia. Featuring world class equipment and services, a full 16 bed Spa facility,"The Spa Clinique", also features offering both international and Thai herbal treatments and massage. Spa Cuisine, Herbal Steam and Sauna, Healthy Juice Bar and Swimming Pool, are also all available to ensure your stay at Royal Phuket City Hotel shall be a fantastic Mind and Body Experience. Cappuccino 154 : Our new trend setting, Funky outlet bound for Stardom, Cappuccino, Espresso, Frappuccino Hot or Iced, Stuffed Sub Sandwiches exclusive in Phuket only at Cappuccino 154, Pastries, Cakes Muffins and 154’s famous Creme Brulee. Pickles Restaurant : International Buffet / a la carte A Cafe by day and a restaurant by night, offering the best in Western and Thai cuisine. Open 06.00 a.m.- 12.00 a.m.
- Atrium Lounge : Beverage / Entertainment The place to be and seen, Great entertainment and great view of the 4 storey atrium: the ideal place to sit back, relax and watch the world go by. - China Town Restaurant : Szechuan Cuisine The finest dining venue in town.Excellent Chinese cuisine in elegant and tasteful decor with excellent views of the surrounding hills.Three private dining rooms available. Open 11.00 a.m. - 02.00 p.m.& 06.00p.m. - 11.00 p.m.
- Thai Thai Restaurant : Exotic Cuisine with the best views of Phuket In among of Phuket's scenery is now serving the cuisine for private group as per your request with many kind of food in your style. Open Any Time You Like. - L' Amandine Deli-Shop : Pastry / Take-away A modern day pastry-deli shop catering mainly for take-aways. Specializing in bread, pastries, home made pies and cookies. Drinks of various kinds such as coffee or tea are also available. Open 07.00 a.m. - 09.30 p.m.